"Flander certainly knows his Philadelphia and his cops. As in his highly praised first novel (Sons of the City), the Philadelphia Daily News reporter plunges readers directly into Sgt. Eddie North's daily life as a cop in a city riven by racial tension. When Sonny Knight, a powerful African-American city councilman, is found beaten on the streets of West Philadelphia, he accuses the first two white police officers to arrive on the scene of inflicting the damage  and then adds Eddie's name to his list when North answers their call for backup. Eddie knows he's innocent, and neither of his cops appears to have been involved in any violence. But the city's police and political leaders, already under pressure from the controversial case of a radical black college professor charged with killing a white cop, seem less than eager to believe North and his men  especially when one of the accused cops appears to have a hidden history of mayhem. Under investigation by internal affairs, Eddie risks his beloved job and several police department friendships as he tries to come up with reasons for Councilman Knight to have lied about his beating. Flander is especially good at showing how decent people on both sides of a racial quagmire can be dangerously blinkered and how easily hard-won loyalties and friendships can be destroyed." "This complex and riveting procedural centers on the issue of racism among cops  both real racism and that manufactured by others for political gain. Sergeant Eddie North narrates the aftermath of "the call," police terminology for an incident that changes a cop's life forever. In his case, the call is to a West Philadelphia alley where a black city councilman has been severely beaten. The councilman accuses two of North's men of the crime. North sticks with his cops, drawing a hailstorm of media criticism. Flander's depiction of a city set afire by the issue of race is very convincing, reminiscent, in its hard-edged reportorial style, of Wolfe's Bonfire of the Vanities. Flander is evenhanded in his treatment of the highly charged topic. He shows the race card being played, but he also portrays a ring of corrupt cops. And he twists the tension even more by introducing a serial cop killer. Compelling." "Plots. They're overrated in mysteries (and underrated in literary fiction). Sure, they're the engine that gets you there, but atmosphere and character linger far longer than who-done-it. You might forget who killed the city councilman in Scott Flander's terrific new book, Four to Midnight (William Morrow, 320 pages, $24.95), but you'll remember Sgt. Eddie North and the two cops under him whose lives get pummeled after they're accused of something they didn't do. Flander writes in a kind of lean, scrappy street poetry honed from years of covering cops for the pugnacious tabloid the Philadelphia Daily News. His cop-shop scenes pop right out with rat-a-tat dialogue and characters you want to spend 320 pages with. What George Pelecanos does for D.C., Flander does for Philly. As his Sergeant North takes you through the city's decaying streets, trying to find out who beat up prominent African-American councilman Sonny Knight, you can practically feel the grime under your fingernails. Knight blames his attack on the first two cops who find him collapsed and bloody on a deserted street. The cops happen to be white, and what follows is an exploration into racism - on both sides of the fence. The book winds through the diverse worlds of black and white Philadelphia, painting a rich, multilayered portrait that doesn't bow to political correctness. This is the second in a series, and Flander is an author to watch." "An edgy yarn from a fresh new voice." "It's hard to believe that Flander, a Daily News reporter, wasn't born and raised in the City of Brotherly Love. As it happens, he hails from California, of all places. He says he's driven around with city cops "hundreds of times," and I believe him. He's got the scene, the idiom and the accents down..." Read the full online review! Four to Midnight is one of January Magazine's Crime Fiction Report Picks for July/August! "...This is a very atmospheric book. Scott Flander manages to paint a very vivid image of Philadelphia and its cops. The subject matter is hard to ignore and it's easy to get emotional about it all. Several times I felt anger and frustration towards various situations and characters in this story. Eddie North is a likeable character. I really did feel for this guy and his situation. There's a good plot too. The clues are there for you to find and there are some nice twists to turn it all on its head. All together, Scott Flander has put together one of the best police procedurals I've read in a long while..." Read the full online review. 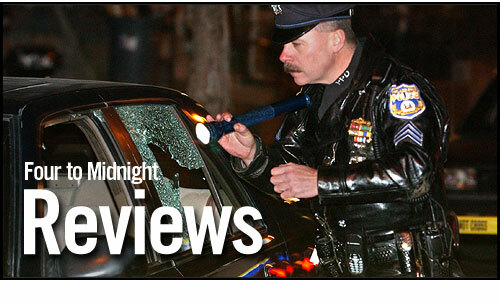 "...FOUR TO MIDNIGHT is more than another urban police story. Instead the theme focuses on how racism engulfs everyone in a swamp and destroys the innocent and their friendships. Thus the audience receives a superb police procedural with a cleverly interwoven powerful message..." Read the full online review. "FOUR TO MIDNIGHT is another example of Scott Flander's unique take on telling a police procedural. Flander manages to put us inside the head of the Sergeant on the beat and through him, show us just how hard those moral and ethical decisions are to make; the constant weighing of shades of gray. There's a thin line that Eddie and every other officer must walk. Flander sheds a bright light on that line and makes you chose sides. It's harder than you might think." Read the full online review. "In this politically correct climate it is jarring to find a book that examines the racial strife that can exist in the inner city between the black community and local police. With Four to Midnight, Scott Flander has established himself as a writer who pulls no punches when it comes to revealing the frustrations and suspicions haunting the inner city world of law and order.... Flander's latest contribution to the Eddie North series is a fast paced, no holds barred look into the harsh realities that exist on our streets and within our communities. The writing is tight and the suspense is tangible. We can only hope that Four to Midnight promises to be the second book of a very long series." The full review will be online soon. Stay tuned! "To put it simply, Scott Flander has done it again! This is another terrific, adventuresome book about the police and the city of Philadelphia. Scott is a master at creating an exciting plot for the reader. The language and "street talk" are powerful attributes to the storyline. Once again, Scott makes you feel that you are right in the middle of the action. If you want a book that has a great plot and plenty of action, do yourself a favor and buy this book!"